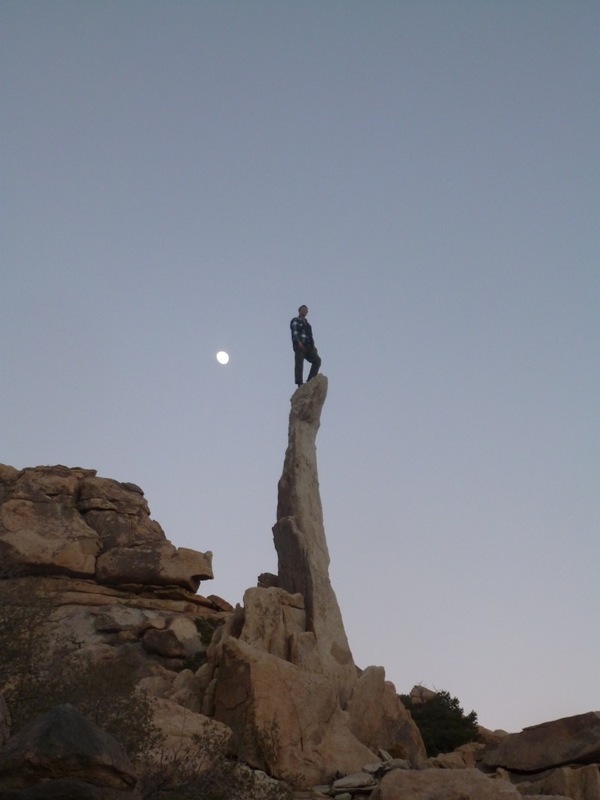 I spent this year’s Thanksgiving week climbing and donating blood in Joshua Tree. Since the rock there is granite that is usually both grainy and slick, and since most of the climbing is crack, struggling often results in cuts. This is even more true for someone like Yours Truly, who is not much of a crack climber. After 5 1/2 days and over 30 pitches of climbing, I have various cuts on my ankles, knees, and the backs of my hands, and my fingertips feel strangely numb while typing. Hopefully I am also a somewhat better climber. A classic crack on Old Woman Rock, near Intersection Rock. While it is crowded, there are other 5.8-ish routes nearby to climb while waiting. A long route (160′?) on the road-facing side of Intersection Rock, which involves just about every type of climbing, including chimney, offwidth, crack, liebacking, and slab. A sport route on Siberia. The first pitch (5.9) is a fun, balance-y climb on a steep, partially-varnished face. The second pitch (5.10a) is a delicate slab affair leading to the top of the formation. Both are well-protected. From either of the “first” anchors, it is possible to toprope the next 5.10a face climb to the right, which is also excellent. A face climb with a roof, located on the Sentinel in Real Hidden Valley. What’s not to love about doing an epic both-feet-off-the-rock mantle in front of an audience? A varied lieback/crack climb on Hemingway Wall. Neighboring Prepackaged (5.10a) is also good. Thanks! Joshua Tree has some pretty cool scenery.